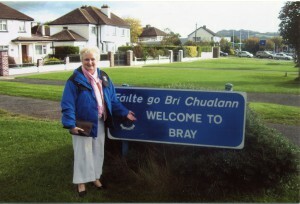 Sister Brigid Bray standing in the seaside city of Bray that is next to the Irish Sea. Her family is from Ireland and this is the hometown of her father’s ancestors. Sister Brigid and her companions enjoyed their visit to the greenest country is the world. It is the home of delicious potatoes and charming leprechauns according to Irish folklore.